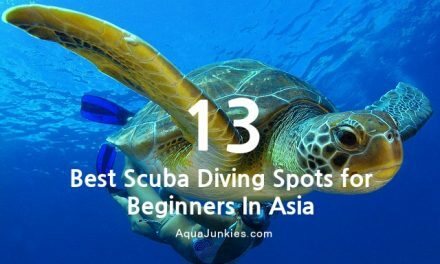 Are you feeling excited to start your scuba diving after watching a video on scuba diving or breathtaking photographs of beautiful corals or colourful fishes surrounding the scuba divers on your social media account? 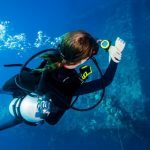 Before you start scuba diving, there are two important gears that you should consider buying first. There are your personal scuba diving mask and a diving computer. Well, you truly need the best scuba mask that fits your face. You don't want a leaky scuba mask while diving. It going to be unpleasant throughout the trip and you don't want that happening to you. If you thinking about renting a dive mask, it should really be your last option to consider renting one. 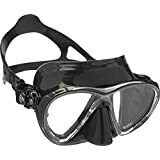 A decent scuba mask is relatively affordable. On the hygiene side, you don't want to go sharing a scuba mask with someone before you that you have no idea who was it. 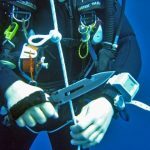 A dive computer is essential to track your dive depth and you really need to be familiar and be adept with your dive computer. 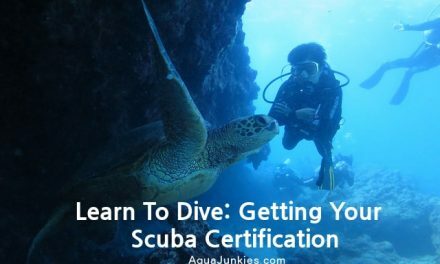 We have have already shared with you how to choose the best dive computer that matches your proficiency. Thank you for visiting Aqua Junkies. 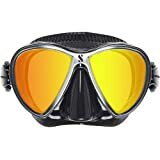 We've done our best to provide you with the most in-depth consumer guide with honest and accurate information relating to the best scuba dive masks currently on the market. A significant amount of time has been invested in providing you with this information, so We do hope you find it useful. 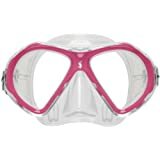 Most Recommended: If you haven't got the time to read our complete buyer's guide then I would suggest that you check out our editors' choice, Scubapro Synergy Trufit Scuba Dive Mask, which we strongly recommend because of its dual lens (prescription lenses compatible), tear drop design for ultimate view. In addition, it has a low internal volume mask design that is suitable for most face shapes. 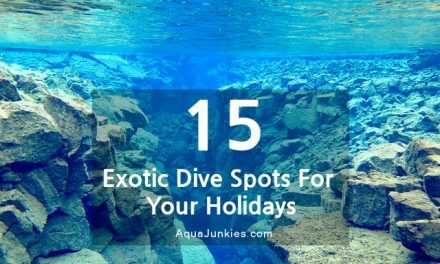 All the essential features that you need for an enjoyable day of diving. Now, Iet's dive straight down into the best scuba masks in the market right now. 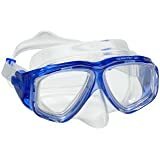 What Are The Things To Consider To Find The Best Dive Mask? 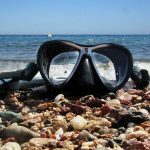 How To Take Care of Your Scuba Dive Mask? 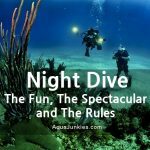 Every month, we will update this section with the best recommendations within various price brackets and also include the best dive masks deals currently on the market. Check out below for this month's recommendations! Please note: These discounts or offers were sourced on the 1st April 2019 and may have changed. View the best dive masks under $200 & above $100! View the best dive masks under $100 & above $50! View the best dive masks under $50! After drinking countless cups of coffee to find the best dive mask available, these are our proud dive mask shortlist that is worthy of your consideration and we are going to reveal our favourites very soon. Currently, in the market, dive masks have either a single, dual or multiple lens configurations. 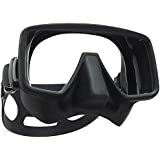 A single lens dive mask has no frame construction across the bridge of the nose and can seem more open for example, Promate Raven Frameless Scuba Mask. It is not possible to have prescription lenses as a replacement for the single lens. 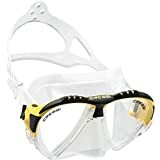 Usually, single lens scuba mask is more suitable for people with better vision without the need of prescription glasses for normal activities. 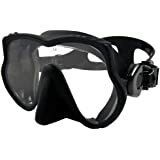 A dual lens scuba mask allows replacement correction lenses due to the design of the mask. It can be easily fitted following the removal of the frame. This is suitable for people who need prescription lenses. 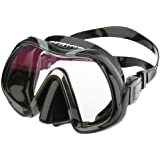 A multiple lens scuba mask has window panes either side sides of the mask. This create a more open and brighter view for the diver. It does not provide additional visibility as the front lenses provide ample of peripheral vision. The lens of a scuba dive mask should be made from tempered glass. The better the quality of the tempered glass, the lower the existence of impurities such as iron that gives the glass a green tinge when viewed from the side. These impurities will hinder the light transmittance into the mask and may cause slight distortion but this isn't noticeable until compared to optical grade lenses. A higher grade tempered glass lens with low impurities allows more light and increases the vibrancy of colours. Len shape is another important consideration. It can determine your peripheral vision. Most scuba masks manufacturers have adopted the reversed drop or teardrop design with a curved top and pointed tip at the bottom. This particular teardrop shape compliment well with a raked frame to provide a generous field of view to both the sides and lower sectors. 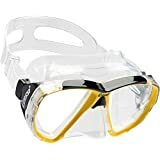 Some masks manufacturers have designed its scuba tempered glass lens to be sitting at an angle instead of been parallel to the diver's face. 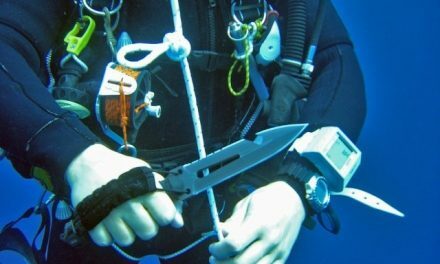 This small change provides divers with two major advantages. Reduces the internal volume of the mask. While choosing your lens, you may like to consider this point. Some examples are Cressi Big Eye Diving Mask and Scubapro Synergy Trufit Scuba Mask. The mask skirt sole purpose is to provide a good seal to keep the air in and water out. When selecting a scuba mask, make sure that the mask skirt is made of high grade silicone for the best level of comfort and superior sealing. Always ask for silicone for the mask skirt, other materials do not provide the flexibility and comfort of silicone. Most quality masks have a secondary skirt. This secondary skirt increases the surface that is able to seal against the skin and significantly reduces the possibility of a leak. There are two type of mask frames, frameless and framed. A frameless mask has a silicone skirt molded around the other components to join them together. This creates a very slimline mask that can be folded very flat. Most people used them as a backup mask that can be easily stuffed in a pocket. Since the lenses are embedded within the silicone skirt it is not possible to replace them if they break or have prescription lenses to be fitted. One such model is the Scubapro Frameless Gorilla Scuba Diving Mask. A frame mask uses a rigid frame which the mask skirt, lenses, buckles and strap are fitted. Framed masks are usually slightly bigger in overall dimensions. The advantage is that these masks can be dismantled easily for proper cleaning, repair, modular replacement or to fit prescription lenses. One good example is the Tusa Liberator Plus Scuba Mask. A silicone strap secures the mask to the diver's head ensure that the skirt and the skin are well contacted to prevent leakage. Everyone has different head shapes, thus diving masks come with a silicone strap needs to be adjustable so that it can be tightened or loosened using a buckle system. There are different types of buckles such as the push buttons to release the strap. However, the latest models have moved the buckle attachment away from the frame and instead placed it on the skirt. This small improvement reduces the stress transferred to the side of the skirt and help the mask to be a better fit and seals better. 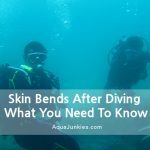 Many divers especially beginners experienced having their hair getting stuck with the strap and it often get messy and hurts. A simple mask slap strap protects your hair from getting stuck in it. It is made of a neoprene sleeve that fits into your mask strap. A definitely great saver add-on for your hair that you can easily get for a few bucks. The best dive mask doesn't turn your day of anticipation, fun, joy and time into a day of agony because of water seepage or fogging. The first steps is to use this review and above information should serve a good start for you. 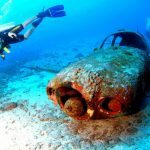 You should have a rough idea what makes a good scuba mask for you. If not, here's a quick summary on what you need to know. You can refer to above for references when choosing your scuba mask. After purchasing your dive mask online, you'll want to test the fit by using below 4 steps. Adjust the strap so that it is at its largest measurement. â€‹Keep any hair out of the mask skirt before you put the dive mask over your face. Make sure its centered and comfortable. Fit the snorkel (if you have one) in your mouth with the scuba mask and then breathe in through your nose. A good seal will have the scuba mask stick to your face as you're breathing normally. Adjust the strap so that it is pulled snug but not tight. Hold your breath. If the mask stays put. You got a winner. If not, then you've got a return on your hands. After every use, you should always rinse your dive mask in fresh water. If warm water is available, use warm water as it will dissolve any salt particles from your equipment. Once washed, allow enough time to completely dry before storing it in the bag. Remember to store your mask in a dry location and out of direct sunlight. The Atom Aquatics Venom Dive Mask is designed with an ultra-wide panoramic view in mind with its tear drop design coupled with German Schott Superwite glass, that enables even more light to penetrate than Ultra Clear glass. It has easy to adjust swivel buckles with a reinforced internal frame molded beneath the silicone rubber skirt. Top of the line mask ideal for those believing in high quality components and performance. The Hollis M1 Frameless Scuba Diving Mask is designed for maximum visibility and distortion free vision. The extra clear glass is valued for its attractive appearance and optical qualities. 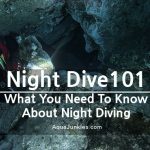 This is especially true in low light conditions underwater where color and visibility are improved.color and visibility are improved. The Scubapro Frameless Gorilla Scuba Diving Mask is definitely a new classic for the professionals. This Gorilla has a slightly wider and larger lens in a matte finish. With its single lens and being frameless site nicely close to your eyes. This provides a wider field of view. The skirt is made of quality soft silicone that provide comfortable fit and durability. The push button buckle system is easy for you to make quick adjustments. 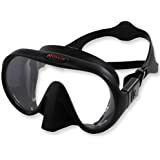 A suitable dive mask for recreational divers or professionals. 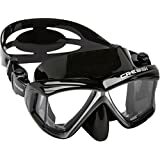 The Cressi Big Eyes Diving Mask with Cressi signature inverted drop lens design increases wider view by 30%. The anatomically shaped frame is very slim line and is invisible when the mask is being worn. The raked lenses and the mold of the silicone skirt drastically reduce the internal volume of the mask. The broad seal ring against the face is designed to make the Big Eyes mask very comfortable to wear. 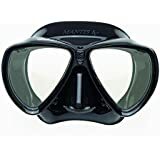 For fans of snorkeling, scuba diving and free diving, this is an excellent mask that deserves a place in your gear pack. 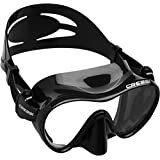 The Cressi Nano Scuba Mask is designed specifically for advanced free diving and spear fishing with its hydrodynamic shape to reduce drag and improve efficiency. It includes a completely flexible, virtually indestructible buckle system. The hydrodynamic design of the mask helps divers to cut through the water and aid movement in small spaces. Cressi Nano Scuba Mask doesn't requires intentional equalizing as internal volume is minimal with its 100% pure silicone skirt. The Tusa Liberator Plus Scuba Mask, an improved version from its original Liberator diving mask with smoother and more durable frame. It has a dual lens square form design for sharp looks. Prescription lenses can be installed. The double feather edged skirt of the mask is made of top grade crystal silicone to provide a comfortable and watertight fit. An excellent choice for recreation or technical diver. The Cressi Panoramic 4 Window Dive Mask is built with multiple lenses precisely joined to main lens for an almost uninterrupted field of view. 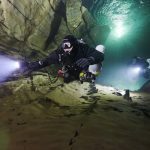 You will get a clear look at what's going on in any dive environment. Cressi uses 100% high quality soft silicone skirt with the double feathered edge for the perfect seal on the face. The mask strap buckles can be easily adjustable. Tempered glass is used for the lens for safety. 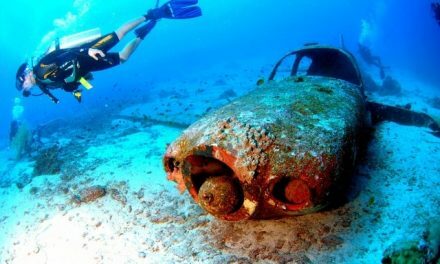 Suitable for recreation dive or deep diving. 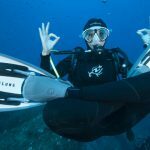 The Scubapro Synergy Trufit Scuba Mask ultra-soft skirt is developed to fit almost every face shape, with its unique rigidity allowing perfect seal and comfort. With the New Trufit skirt, same high quality silicone skirt with 2 different thickness is used instead of 2 separate materials. This assures total comfort and simplicity. 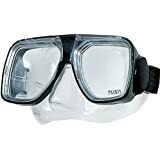 An excellent mask that is essential for premium diving adventures for comfort and performance. The Speedo Adult Recreation Dive Mask comes with 100% silicone skirt for the ultimate comfort. The lens is coated with Speedo exclusive Anti-Fog Max for a clear view. This is a recreational Mask that offers a long-lasting, comfortable performance. 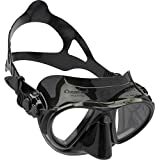 Decent mask for comfortable recreation dive. The Cressi Big Eyes Evolution Mask is made from High Seal, a new material that extends further extraordinary comfort than normal scuba mask due to its exceptional softness. The design of the skirt followed new rules that allow better contact point between the mask and the face with a wider open angle. It is unlikely the scuba mask will leave any mark on the skin even after extended use. Coupled with an inverted drop shape lens that increased the visibility of the Matrix by 25%. Prescription lenses can be used. The elastic headband has its buckles of strap mounted on an indestrctible elastic element that tilts on a vertical plane and can be bent sideways on a 180Â° curve. This ensure better fit and comfortablility. Common mask designs usually have the buckle of staps mounted on the skirt structure. 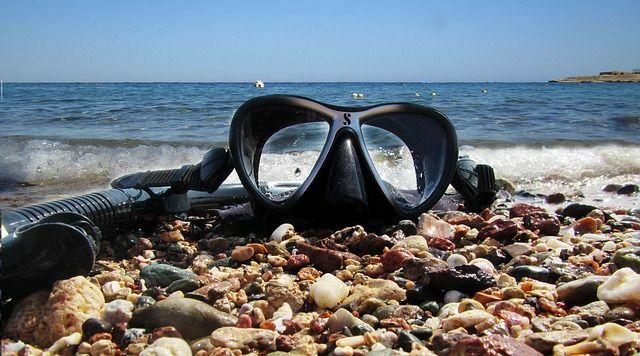 The best scuba mask is going to be one of your most trusted buddy throughout your entire diving adventures. It should be comfortable, secure and a good fit for you to get the best panoramic view possible. 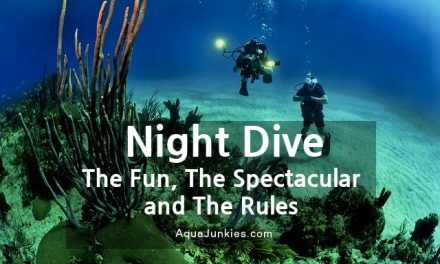 Below are some of Aqua Junkies favourites that will make your diving trip enjoyable and comfortable. 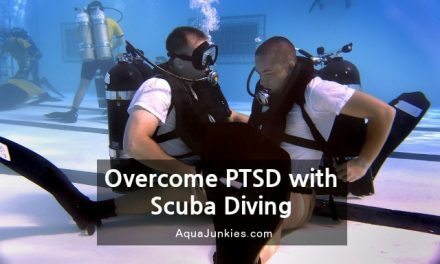 Right before you start descending with your scuba mask, push the scuba mask lightly toward your face. This will push some air out and create a good pressure seal. As you descend slowly into the water, the surrounding water pressure will then create a pressure on your mask for you. The deeper you dive, you will feel the mask getting tighter. This is the time you can blow some extra air into it from your nose to lesser the pressure.